PACKAGING NOT GUARANTEED TO BE IN MINT CONDITION. NOT MINT ITEMS MAY SELL OUT AT ANY TIME. ORDERS MAY NOT BE FILLED. Celebrate the 25th anniversary of Tim Burton’s The Nightmare Before Christmas ! 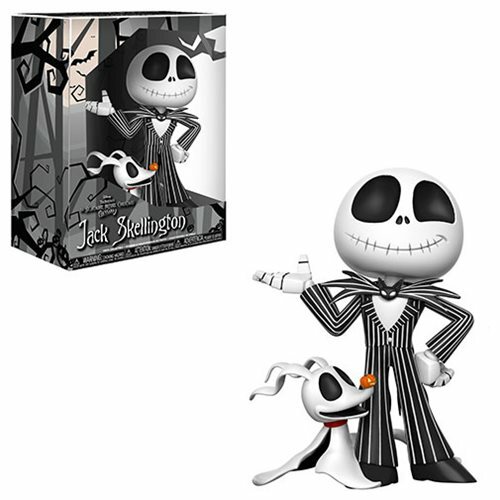 Add a gem to your collection with this Nightmare Before Christmas Jack Skellington Super Deluxe Vinyl Figure. Standing approximately 10-inches tall, Jack is a standing proudly with Zero at his side. This ultimate collectible comes packaged in a themed window display box. Ages 3 and up.